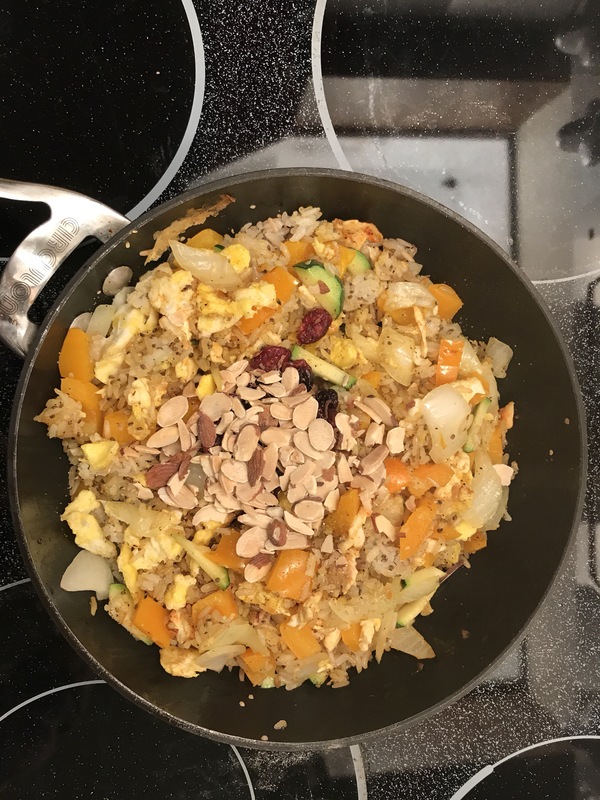 How to cook healthy egg fried rice? Have a healthy base: Cooked Brown Rice with hemp seeds and chia seeds. 2. When cooking rice, use half portion of brown rice and half portion of white rice. After it is done, mix in some chia seeds and hemp seeds as seen below in the photo. Keep the above cooked rice in the refrigerator overnight. Overnight rice is used for fried rice, so it will come out firm and not mushy. Please do not use soy sauce. It will ruin the flavor! Add the oil and Stir-fry the egg on a hot pan. Set aside in a bowl when done. Add butter or oil or both in the pan, stir fry the veggies (put the harder veggies first). After stirring for about three min. when veggies are almost done (avoid overcooking it), add the rice and keep stirring them until they look similar to the photo above. Then add nuts and raisins. Then add turmeric powder, pepper, and salt. I love it! It tastes so good that I have eaten two bowls of this! Let me know how yours come out and how you like it in the comment below. Spaghetti--You can make it as healthy as you like!